8 red and 7 white stripes. The stripes were each two feet wide. When it was finished it measured 30 by 42 feet and cost $405.90. 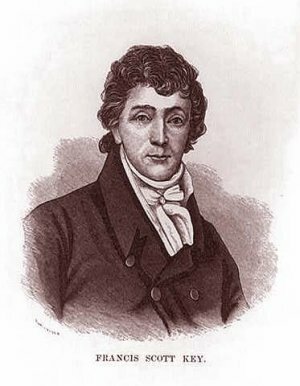 During this time Francis Scott Key was a lawyer in Georgetown, just a few miles from Washington D.C. He and his wife Mary had 6 sons and 5 daughters. In 1814, the British captured Washington and set the Capitol on fire. President James Madison and his wife Dolley had to leave the White House and run to a safer place. After this attack, the Americans knew that Baltimore would be attacked next. The British had captured Mr. Key's friend. His name was William Beanes and he was a doctor. Key and another man set out to try to save Dr. Beanes' life. They told the British the doctor had helped to save British soldiers who had been wounded. They agreed to free him, but they wouldn't let them leave because the three men had overheard the British making plans to attack. So they were placed under guard on a British ship. It was from this ship Francis Scott Key watched the bombing of Ft. McHenry. There was a lot of smoke and haze, but when daylight came, he could see the flag was still waving. He was so inspired he began to write a poem on the back of a letter he had in his pocket. He later finished the poem and showed it to his brother-in-law who took it to a printer and had copies made of it. Two of these copies survive today. Newspapers started printing it and people began singing it to a familiar tune. 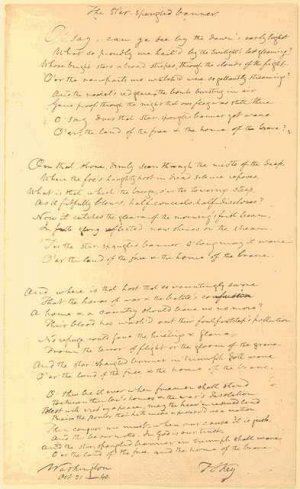 The Star Spangled Banner was adopted as our national anthem on March 3, 1931. The flag which flew over Ft. McHenry is now at the Smithsonian in the Museum of American History. The flag is very fragile and they keep a curtain in front of it to protect it from the light and dust. They show the flag for a few moments once every hour when the museum is open to the public. See The flag that Francis Scott Key saw at Fort McHenry. 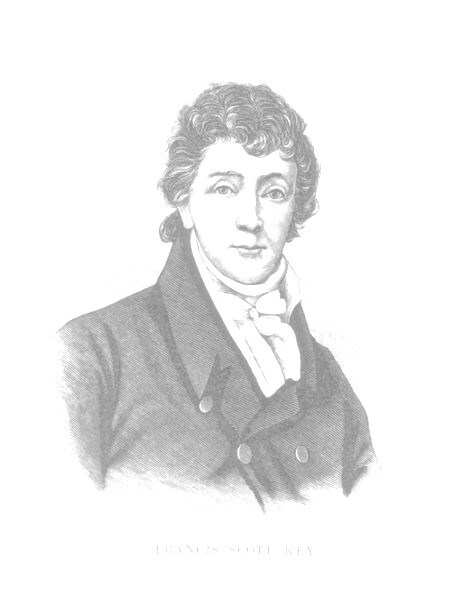 Francis Scott Key and "The Star Spangled Banner"
The picture on this page may be used without permission. It is in the public domain and can be found at the Library of Congress. dont make the page so long if there is barely any info. Who was the author of this page? this was an awesome resource for my history paper, thanks! This page displayed 164,660 times.